Pesto is the ultimate comfort sauce, and our Healthy Single Serving Oil-Free Pesto Sauce is so good that you could eat it by the spoonful without feeling one bit guilty. It’s made with only four simple ingredients and zero saturated fat. Dig in! Published August, 2015 – Modified March, 2019. This post contains Amazon affiliate links. Purchases made through these links help support Veganosity.com at no additional cost to you. 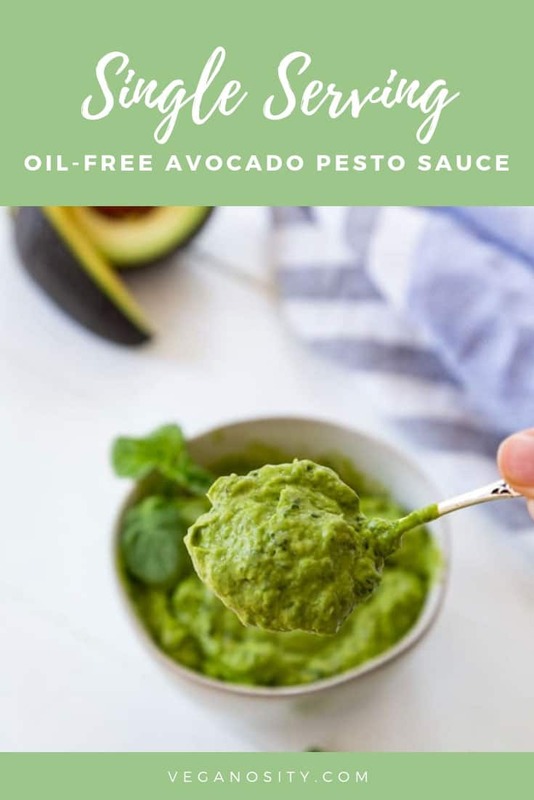 Healthy Single Serving Oil-Free Pesto Sauce That’s Easy and Delicious! Please indulge me while I brag on my smart as a whip, health conscious, and beautiful daughter. Alex is the one who inspired me to become a vegan, to cook with less oil, to lift heavier weights, and—for this I’m eternally grateful—create Veganosity. She’s also the mastermind of this easy, creamy, and healthy single serving OIL-FREE pesto. 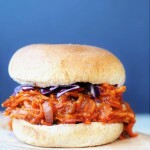 If you’ve been following us for a while, you know that we’re all about vegan comfort food and eating. We adore things like, lasagna, enchiladas, and BBQ, and we’ve proven time and time again that you don’t have to give up your favorite foods just because you stopped eating animal products. So you could make a fresh serving of pesto whenever you needed one. You don’t have to store the leftovers because there won’t be any. If you can’t or won’t eat oil, this recipe is for you! CAN YOU MAKE OIL-FREE PESTO WITHOUT PARMESAN CHEESE? Yes you absolutely can, and it’s every bit as delicious. 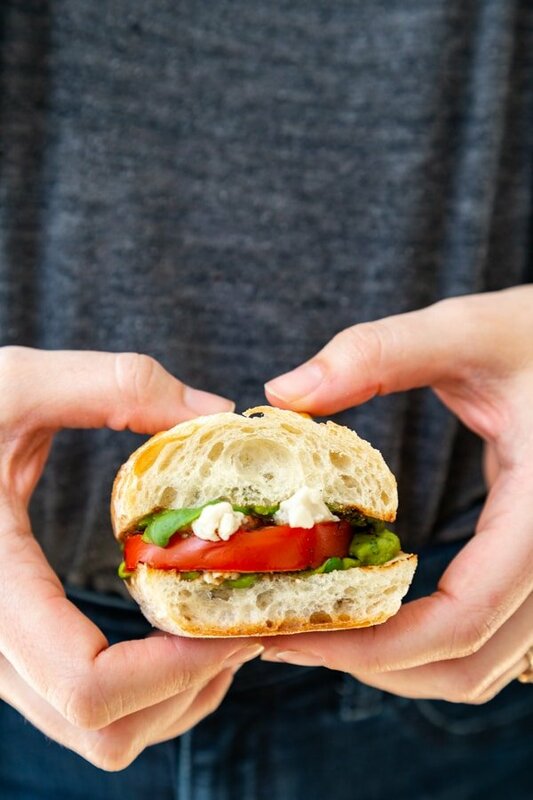 As you can see, we step outside of the box when it comes to making pesto. You don’t have to use expensive pine nuts, parmesan cheese, and olive oil to make a delicious pesto sauce. There are so many awesome alternatives. WHAT INGREDIENTS CAN I USE TO MAKE OIL-FREE PESTO? 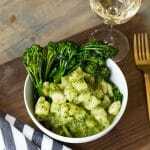 Avocado makes the pesto creamy and replaces the olive oil. Garlic, lemon, and basil are the ingredients that make this recipe taste like classic pesto. Nutritional yeast is a great substitute for Parmesan cheese because it has a cheese like flavor. Now, we do add a bit of water to make the pesto the consistency of a sauce, and we added a bit of sea salt and black pepper for extra flavor. It’s totally up to you. Nutritional yeast is in the same family as the yeasts used to make bread, beer, and kombucha. The difference is that unlike baker’s and brewer’s yeasts, nutritional yeast isn’t active. You can’t use it to make dough rise and you can eat it before cooking. It’s also fortified with B vitamins, including B12, protein, vitamins and minerals, and antioxidants. It’s good stuff. We like to use it in pesto and other savory recipes because it has a cheesy, nutty, umami flavor. Avocado is naturally creamy and has a similar mouth feel as olive oil. When you blend it with a bit of water, it makes a great oil substitute. The addition of garlic and salt to the recipe, which are two mainstay ingredients in pesto. The nutritional yeast takes the place of the Parmesan. It has a cheesy flavor and the texture is similar to a finely grated cheese. 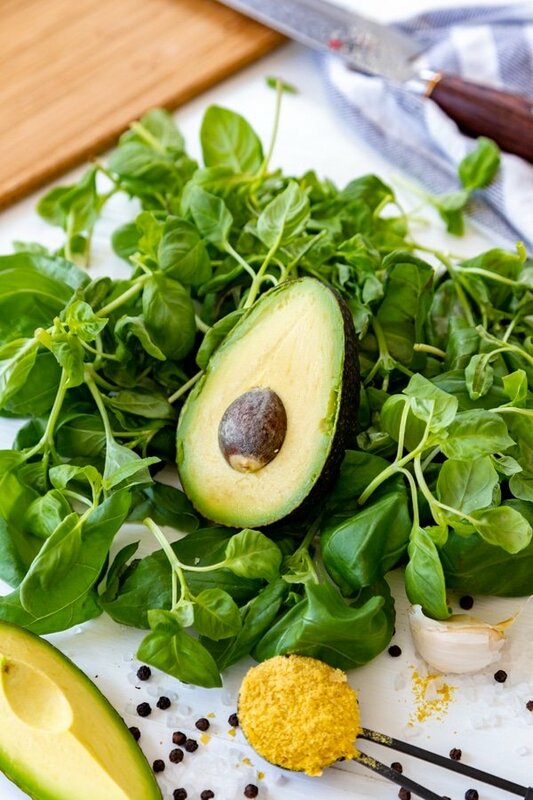 Lemon ensures that the avocado won’t brown and it gives a slight tang to the pesto. HOW CAN I MAKE OIL-FREE PESTO FOR ONE? Quarter an avocado, peel it, and put it in a blender. Add the nutritional yeast, basil, lemon, garlic clove, and salt and pepper. Blend until the basil breaks down and the sauce is creamy, adding the water 1 tbsp at a time until you get the consistency you desire. Slice and put on top of a salad. Turn it into raw chocolate pudding. WHAT CAN I SERVE PESTO WITH? Smear it on top of crusty bread and make a sandwich. Toss it in pasta for a savory dish. Spread it on flatbread and top with meaty Portobello mushrooms. Use a blender or a small food processor to make this. The basil needs to be broken down into super small pieces, and this is really the best way to do this. We use this blender. Click the photo to learn more. If you don’t have a blender, you can use a small food processor. We tried using our 11 cup processor but there wasn’t enough avocado to make it work. Add 1 tablespoon of water at a time until you get the consistency that you’re looking for. 1 tablespoon will make a thick sauce, 3 to 4 will make it much thinner. Include a bit of salt and pepper for added flavor. For best results, eat it as soon as you make it or within a few hours. Feel free to double, triple, or quadruple the amount of avocado and basil if you want to make it for more people. Just don’t double, triple, or quadruple the garlic and nutritional yeast or it will turn out too strong in flavor. Add two garlic cloves if you quadruple and a few extra teaspoons of nutritional yeast as you go and taste it to see if you would like more. Make our vegan oil-free pesto and let us know what you think. We love to hear from you! And, don’t forget to take a picture of your gorgeous creation and tag us @veganosity on Instagram. 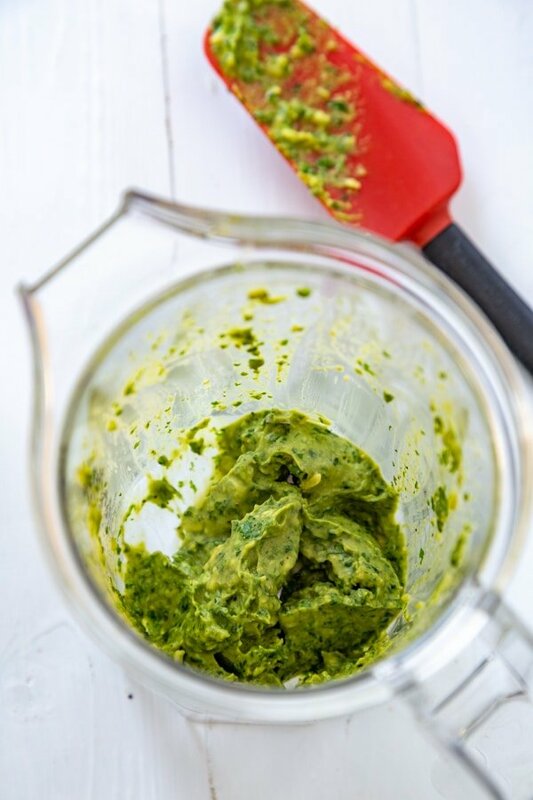 A creamy, delicious, and healthy oil-free pesto for one, made with four simple ingredients! 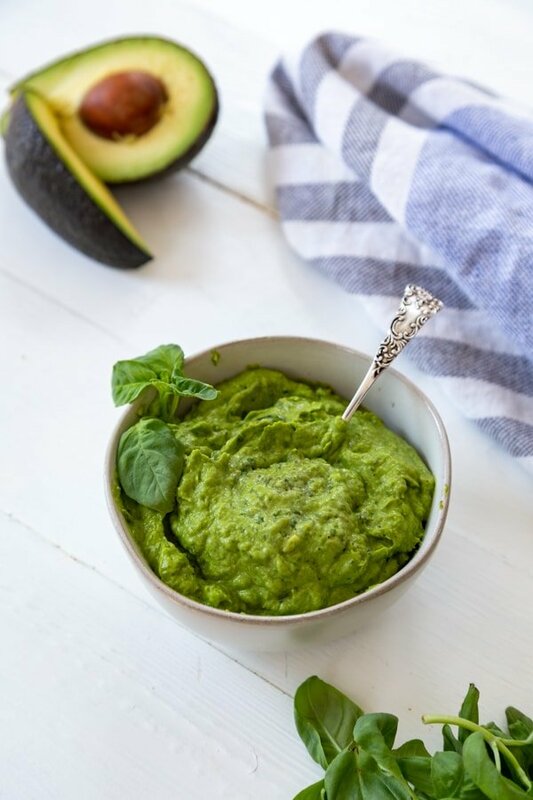 Put 1/4 of the avocado, 1 cup basil, 1 garlic clove, 1 tsp lemon juice, and 1 tbsp nutritional yeast in a food processor or blender and blend. Add the water 1 tablespoon at a time until you get the desired consistency. Add salt and pepper to taste. To preserve the remaining portion of the avocado - squeeze some lemon juice on the rest of the avocado and seal it up tight with plastic wrap. 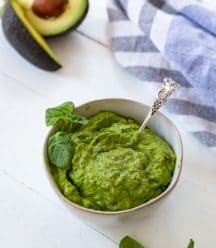 It will stay fresh for the next day and you can use it for guacamole, or a sandwich, or a salad, or just eat it as is with a little balsamic vinegar drizzled on top. If it turns slightly brown overnight, just slice off the top. No big deal. 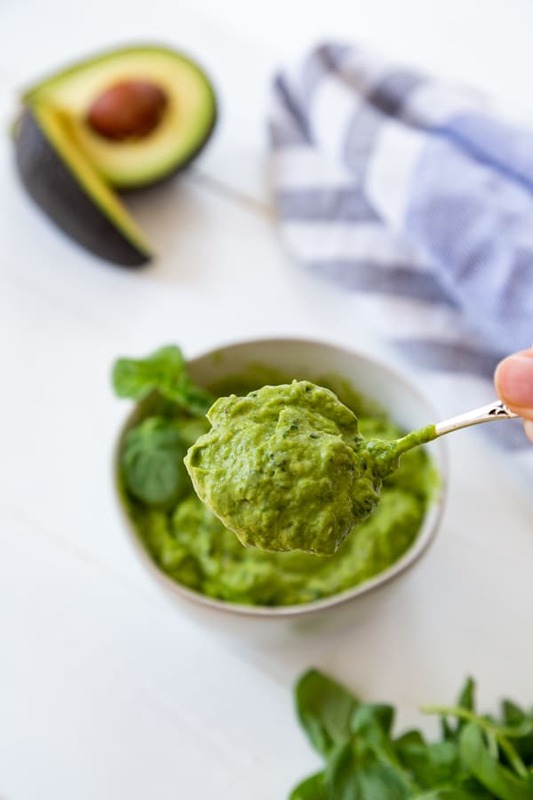 You could also just mash the avocado, mix in a bit of lime juice, put it in an airtight container, put a layer of plastic wrap on the avocado and then put a bit of water on the plastic to prevent air from oxidizing it, cover it and keep it in the fridge for up to three days. To make a large batch of pesto - use the entire avocado, add and extra two to three teaspoons (taste and add to get the right amount) of nutritional yeast, two to three (add and taste so it’s not overpowering) garlic cloves, three more cups of basil leaves, extra salt and pepper to taste, and as much water as it takes to whip it into the perfect texture. Substitution - If you don't like nutritional yeast, feel free to substitute with grated vegan parmesan cheese. What a fantastic idea, subbing avocado for oil & nuts! Very creative. ? This sounds really good, I am wondering if I can freeze it? I just made this and it's soooo good! Any idea how long it'll stay in the fridge?